Manage both hardware and software and their client assignment. Link them to tickets, and track asset history and related service requests. Assets can have peripherals, software, parts, and connections with other assets, establishing parent-child relationships between these. Easily import asset inventory from third-party asset discovery tools and network management systems. Utilize hundreds of hardware and software data points to automate your troubleshooting. Manage hardware, software, and associated tickets and end-users. Check in and check out loaner assets with ease. Simplify hardware replacement research through a complete list of tickets per asset. Allow end-users to link service requests with physical assets. Helps prevent unexpected warranty and lease expiration surprises. Simplify asset management with automated asset discovery. Designed to discover all your hardware and software assets and help keep your hardware inventory up to date by scheduling automated asset discovery. The Web Help Desk® software allows you to discover systems with its built-in scanning engine based on subnet or IP range. You can also discover hardware and software inventory information including hostname, model, serial number, logged-in user, operating system, hard drive, memory, and installed software. Additionally, Web Help Desk supports out-of-the-box integration with popular asset discovery solutions and provides instant access to associating asset data with service tickets. Asset discovery data from any source can be scheduled to import regularly or on-demand into Web Help Desk. Web Help Desk supports scheduled synchronization of asset data from SolarWinds Network Performance Monitor, Server & Application Monitor, and Network Configuration Manager. Manage both hardware and software and their client assignment, and build parent-child relationships between assets to make tracking a snap. Enter asset purchase order information and let Web Help Desk calculate warranty and lease end dates. Define asset types, status, locations, manufacturers, and models for simple tracking and comprehensive asset management. Software license deployment tracking is a must-have. How many Word processor licenses does your organization own? How many does it need? Do you really need to order more for the new hires? Web Help Desk offers a direct overview of software licensing distributions across your network, including how many license keys of a particular software are in the field versus ready for assignment. Built-in integrations with asset discovery solutions provide the capability to display complete software installations per asset. Check in and check out loaner assets with ease. Rivaling the Dewey Decimal System, the Web Help Desk software’s reservation center allows end-users to request a specific time and date range for asset check out. Maybe a teacher needs a rolling AV unit, or an employee needs a laptop for a business trip. Additionally you can help minimize lost or stolen inventory with our overdue alert feature. Simplify hardware replacement research per asset. Web Help Desk provides a complete audit trail of service tickets associated to each asset. Assign an “asset” during ITSM ticket generation, tagged as either an incident, problem, or service request. 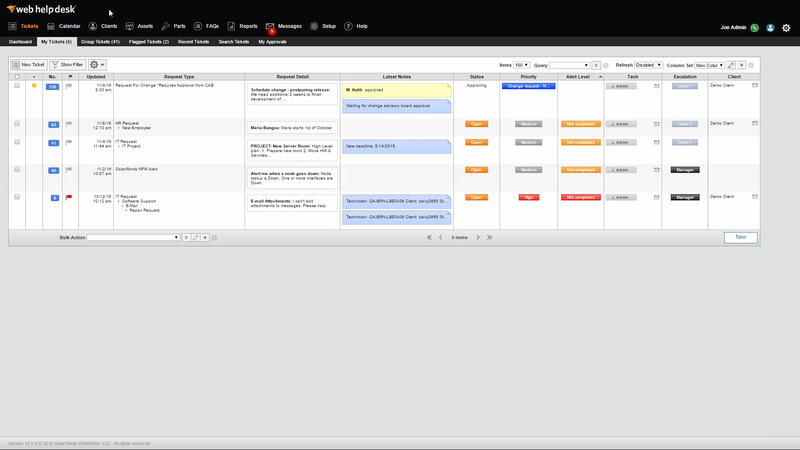 Each asset then holds an extensible and searchable timeline and history. Visibility into the asset’s health provides critical insight to avoid potentially expensive repairs or replacement plans. Allow end-users to link service requests with physical assets. Associating an ITSM ticket with an asset is easy. Web Help Desk allows you to assign one or more people to a piece of hardware. When an ITSM ticket is created by either an end-user having trouble or by IT personnel taking a call, a list of the end-user's assigned assets is revealed. This end-user ownership feature helps promote help desk efficiencies and cost-saving business decisions throughout the entire asset lifecycle, thus simplifying IT asset management. Prevent unexpected expirations. Web Help Desk provides warranty information at a glance. The warranty expiration date is automatically calculated, and email alerts are configured to ping management, providing ample time for making business decisions. The lease contract on a piece of hardware is due for renewal, but it slipped your mind for the budget. What now? Lease expiration date alerts available in Web Help Desk help ensure that your budget proposals are encompassing. IT asset management simplified with Web Help Desk. See how straightforward hardware and software inventory management can be.